The airbrush is a spraying tool and requires pressurised air to work. Your choice of air source is extremely important - an inadequate supply of air and you will not get the performance from your airbrush. The two main types of air source are canned propellant and compressors. The section below tells you ways to find the right compressor on our website and the glossary of terms should help. Choosing the wrong machine could prove to be costly. so if in doubt please contact us. Using cans of propellant may be a way of trying out airbrushing without the outlay of a compressor if you are a beginner or are on a tight budget, but you will not get the best results with propellant and the money you spend replacing the aerosols would be best put towards a compressor. Click here to view our Compressor Application Guide, Airbrush/Compressor Compatibility Guide and Compressor Comparison Chart. Lookup your application on our Application Guide, then click on the names of compressors that are shown as R for Recommended, E for Excellent or C for Compatible. Those listed as 'R' are our top recommendations so that gives you the shortest list to consider. You can extend your browsing to those with E or C if you have different requirements or preferences from the mainstream or if you are looking for one compressor that is a good compromise between two different applications. Lookup your airbrush (or the airbrush you are considering) on our Airbrush Compatibility Guide, then click on the names of compressors that are shown as green for recommended or yellow for compatible with the airbrush you will use. The chart also tells you how many of each model of airbrush or spray gun the compressor can run concurrently if you are looking for an air source to power multiple workstations. Use the Compressor Comparison Chart if you already have a good idea of which features you want. This shows all the specification directly compared in one place. The description of each compressor on our website will tell you which type of airbrush and specifically which of our airbrush models that the compressor is suitable for and how many of that model of airbrush it will run concurrently. This is listed below the compressor features/specification on each of the compressor pages. If you have chosen an airbrush or already own one of the airbrushes on our website, then find the airbrush product page and scroll down to the bottom of the page and click on the recommended compressors link. If you are choosing both an airbrush and compressor, then it's usually best to choose the right airbrush for your application first as that is the real creative tool that needs to perform in your hands. Then your choice of airbrush will lead you to look at compatible compressors. Click here for advice on choosing the airbrush. Click here to view our airbrush & compressor kits for all applications! If you are in the market for both an airbrush and compressor, then go to the Kits/Systems section and view the kits we've assembled for you particular application. Only compressors suitable for your application will be available in these kits, so you can narrow it down easily based on application and budget. The airbrush/compressor kits save you money compared to buying the items individually. The kits also contain a recommended airbrush, making the whole choice a lot easier. However, once you've found the most appealing kit, you can consider upgrading the airbrush. Only upgrades suitable for your application will be listed as kit option. To decide on the airbrush, please follow our advice on choosing the airbrush - or please do call on us! Please call us for advice. If your airbrush is not listed in the compressor pages or the compatibility charts, or you are in any doubt about the suitability of the compressor for your airbrush and your application, then we can still find the right compressor from our comprehensive range if you contact us. We highly recommend calling us as a compressor is a significant investment and we want to make sure it best suits your needs and budget. Of course you can use any combination of the above methods of narrowing your search down to the perfect compressor for you. Air source - a compressor or canned propellant that provides compressed air. Airflow / Air Volume Delivery - The amount of air that the compressor can deliver. This governs how many airbrushes you can run with the machine. Airflow is measured in CFM (Cubic Feet per Minute) of lpm (litres per minute). You can lookup the volume delivered by our compressors in the Compressor Comparison Chart or on the compressor product pages, whilst the Compressor/Airbrush Compatibility Guide tells you typically how many airbrushes may be run on each model of compressor. An Iwata 'Handle-Tank' compressor has an air reservoir built into its tubular handle! Air tank / reservoir - A storage tank that the compressor pumps air into, typically found on higher spec machines. This results in a smoother, more controllable airflow. Although an air tank evens out air flow, there is no 'pulsing' of air on any of the Iwata Studio Series compressors that do not have an air tank. The air tank will trap more condensation than a filter alone, so compressors with tanks deliver cleaner, drier air. Also an air storage tank means the compressor motor will not turn on and off as often, so this results in less noise and longer life of the motor and the auto-stop switch. Automatic / 'Auto-stop' switch - Usually present on compressors with a tank, but also on some without tanks. Iwata call their auto-stop switches 'Smart Technology'. This auto-stop switches the motor off when a maximum pressure in reached, and back on again when the pressure drops to a minimum pressure. These machines can be left on and will begin to run again only when required. This means less motor wear and less noise. These are good solution for longer periods of usage or a busy professional environment. An an end-of-line filter traps the last drops of moisture that condense as air cools in the hose. Moisture filter - Removes water condensate from the air supply. Condensation coming through your airbrush with the medium can cause spattering or a streaky application. You need to press the moisture release on the filter regularly to avoid excessive build-up of trapped condensation. Also the filters act as a small reservoir on the tank-less models of Iwata compressors, which evens out the airflow so there is no pulsing. Air becomes hot when compressed. As the air leaves the machine, it decompresses and cools, and any moisture in the air condenses into liquid form. This is more of a problem in colder, humid climates such as the UK, where a moisture filter is essential for all but the smallest compressors. If you have a small compressor with no built-in moisture filter, or even if your compressor does have a moisture filter, you can add an end-of-line moisture filter at the airbrush end of the hose as a last line of defence to trap the last few drops that condense in the air hose as the compressed air cools on its way to the airbrush. Iwata Power Jet Pro has twin regulators - one for each outlet. Air regulator - Allows adjustment of the air pressure supplied to the airbrush. Usually the compressor also has a pressure gauge so you can see the air pressure and the adjustments you are making and always be able to find your recommended or preferred pressure settings again. A proper compressor regulator gives better control over the air pressure than a simple adjustable air bleed, although even finer control for tiny adjustments in air can be achieved at the airbrush end by adding an external Micro Air Control (MAC) valve or by choosing an airbrush with a built-in MAC Valve, which positions the control right at your fingertips while working. Air Bleed - Found on machines without an auto-stop. On some machines an air bleed off is crucial to the correct running of the machine, such as tank-less diaphragm machines. In some cases the air bleed is adjustable providing an inexpensive way of pressure adjustment, though not as precise as an air regulator. If you are using pressure to achieve different atomisation effects with the airbrush, then it will be better to use a proper regulator for pressure adjustment. Psi - A measurement of air pressure - pounds per square inch. It is the amount of force (or weight) in pounds applied by the air pushing onto an area of one square inch. Iwata airbrushes atomise well at low pressures, extending your choice of air source to the smallest compressors. An Iwata airbrush can atomise well at just few psi for airbrush makeup where low pressure is crucial for safety in spraying around the eyes, up to high psi of 40+ psi for applications such as T-shirts where the paint particles have to hit fast to penetrate deep into the fabric. Generally for most applications the Iwata airbrushes operate well at between 15 psi and 30 psi and you will need to experiment with your preferred pressure for your paint mix, atomisation and desired control over speed of working. We recommend you set the pressure and read the gauge with the airbrush trigger depressed to know the pressure you will actually be working at. Click here to compare the pressure of compressors - or any other tech spec. It may be easier to use the airbrush compatibility guide or application guide on the same page if tech spec is not your thing. You will need to ensure the compressor you buy can provide the air pressures required by the application. 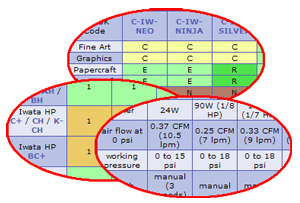 The Compressor Comparison Chart shows the range of psi (as do the compressor product pages), whilst you may find it simpler to view the Compressor Application Compatibility Guide to see which compressors provide enough air for which applications. It is worth noting that the technical specifications of compressors often quote the maximum standing pressure when no air is being drawn. As soon you press the airbrush or spray gun trigger, some air pressure is let out and so the pressure gauge will always drop a little. The actual 'operating' pressure is therefore lower than the 'standing' pressure. Also the operating pressure achievable will be different depending on the model of airbrush and the air volume it lets through. The quicker the air is taken by the airbrush, the less pressure can be built up by the compressor. Some low to medium quality brands tend to be 'gustier' on air, requiring more air volume and therefore larger, more powerful and noisier compressors. While higher quality airbrushes such as Iwata need less volume of air and can atomise using lower at lower pressures. You can see which compressors can run which airbrushes in our Compressor/Airbrush Compatibility Guide. Bar - A measurement of air pressure. 1 bar is the atmospheric pressure of the Earth at sea level. 1 bar is approximately 15 psi. Diaphragm Compressor - A pulsating membrane compresses the air. Diaphragm compressors are fairly noisy and cannot be run for extended periods of time, so they are more suitable for hobby applications than professional use. We recommend attaching a moisture filter to remove condensation from the air supply and to even out the pulsing. We discontinued our last remaining diaphragm compressor a few years ago due to drop-off in demand caused by the huge rise in popularity of our much quieter-running oil-less piston compressors. Piston Compressor - A piston or pair of pistons compress the air. Piston machines are quiet running and therefore exceptionally well suited to applications where noise would interfere with the creative process or the working environment, such as art studio or beauty salon. A single-piston compressor has one piston and a twin-piston machine has two pistons. A twin piston compressor is approximately twice as powerful as a single-piston compressor because it is compressing twice as much air at the same time, but the extra mechanical work does mean the twin-piston machines are slightly noisier. Also a piston machine running at twice the motor speed or rpm (revolutions per minute) is compressing more air in the time, so it is more powerful, but again noisier - more decibels in noise with a higher pitched sound which is a little more intrusive to the environment. However, whether twin-piston or twice the rpm, the Iwata Studio Series compressors are much quieter than diaphragm compressors or industrial compressors. Click here to view our piston compressors. Oil-less Compressors - Piston compressors (above) can be either of the oil-filled or oil-less type. Oil-filled compressors are usually more silent as they benefit from the lubrication of the oil, but oil-less compressors like the Iwata Studio Series are still very quiet running compared to diaphragm compressors and industrial compressors. The main advantage of oil-less compressors is that you do not have to remember to check or change any oil, making them low maintenance, and there is no risk of spilling oil when your compressor is in transit if you are mobile. Click here to view our oil-less compressors. Industrial compressors - If you wish to run a small spray gun with a larger nozzle or at higher pressures then you will need a bigger industrial compressor. The disadvantage of an industrial compressor is that it is noisier - that's because it has to work harder to compress more air. Click here to view our industrial compressors. BSP (British Standard Pipe) fitting - The standard pipe fittings used internationally on many airbrush brands and most compressors. Some aibrush brands have a proprietary sized fitting and thread type on their airbrush air valves, and occasionally use the same fitting on their own-brand compressors. However, nearly all compressors have BSP fittings on their air outlets. Most medium to large compressors have a 1/4 BSP fitting and often smaller, more portable compressors have a 1/8 BSP fitting. There are some larger, more rarely used sizes on industrial machines such as 3/4 BSP. We stock adapters for the most common BSP sizes (1/8 and 1/4) and the main brand proprietary fittings. The '1/4' refers to 1/4 inch, and '1/8' is 1/8 inch, which are the approximate diameters of the bore size of a pipe, and is not a measure of the thread of the connector/adapter. If you want to determine the size of BSP fitting then you can measure the external diameter of the male thread or internal diameter of the female thread, which should be approximately 1/2" (13 mm) for a 1/4 BSP fitting or about 3/8" (9 mm) for a 1/8 BSP fitting. Propellant cans - Pressurised air contained in a CFC-free aerosol can. You will also need a propellant can valve to connect a can to your air hose. The can valve crudely regulates the air flow. Propellant cans are a short-term solution for getting started. They do not offer a great deal of control over the air pressure. Once you have purchased a compressor, the air is essentially free, whereas the propellant cans need regular replacement. The high pressures supplied by a propellant are not recommended for beauty applications such as tanning and makeup. Obtaining the appropriate lower pressure using a compressor will be safer and more comfortable for the client and gives better efficiency of application. As aerosols are classed as UN1950 hazardous goods, we cannot send them in the post. These have to go by courier, so it costs the same to send one can of propellant as it does to send a dozen cans. Therefore it makes sense to order several cans at one time (or with aerosol airbrush cleaners) to spread the cost of the carriage over each item - You will get through them! Click here to view our propellant. Click here to for more information about Iwata Studio Series compressors. Click here to view our compressor and propellant product pages. Click here for a guide to choosing your airbrush, which you should usually do before choosing your compressor, unless you already own a compressor or you are choosing an assembled kit.